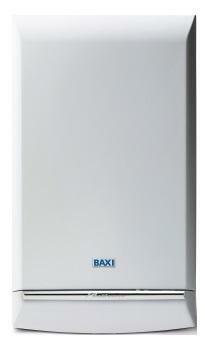 This model is a combi wall mounted gas boiler by Baxi. The duo-tec is a favourite from both installers and household owners, with it being voted CORGI boiler of the year and being the best selling boiler in Baxi’s range. With this boiler being designed with reliability and energy saving in mind. This boiler is able to save you money on your heating bills but can still produce the efficiency you want. It is B rated for both heat and water and has an output of 33kW, with an efficiency rating of 88.5% and leading hot water flow rates so you can be positive that it is a reliable boiler. Featuring user friendly controls and display that are clear and easy to read. With the frost thermostat protecting your boiler water from freezing on the cold wintery days meaning you are able to place it in your garage or loft. This Duo-tec comes with a pre-plumbing jig, a pre-formed copper pipe tail, built in filling loop, and 1 metre main cable to help for quick installation. It is also available in the outputs of 28kW, 33kW, 40kW as well as a dedicated LPG model with the output of 28kW making the Duo-tec perfect for any sized home, and let’s not forget the 7 years warranty - so you’re covered.